The cost of the high-speed rail project might be going above the current estimate of $68 billion. The California High-Speed Rail Authority recently announced a strategic shift to consider an alternative for its 40-mile Palmdale-to-Burbank link. 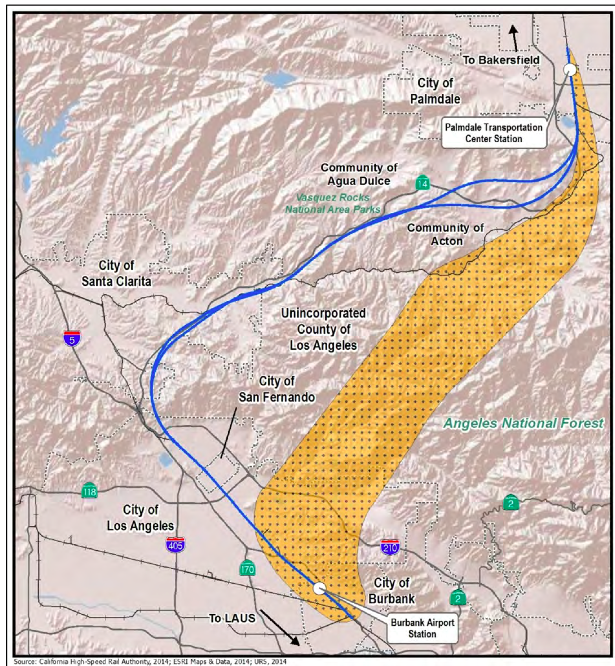 Instead of the current plan of running it parallel to the Palmdale Freeway, the new line would run through a tunnel under the San Gabriel Mountains. According to Los Angeles County Supervisor Mike Antonovich, who has advanced the idea, the tunnel would be about 15 miles long. The CHSRA told CalWatchDog.com that it did not yet have estimates on the tunnels’ cost. But it’s possible to calculate a rough — very rough — estimate. Let’s start with something we know: the tunneling cost for the proposed extension of the Long Beach 710-Freeway: $6 billion for a 4.9-mile segment, which works out to $1.22 billion per mile. Next, let’s return to the proposed high-speed rail land surface route, on which we have an official estimate. The proposal to run the 40-mile Palmdale-Burbank link on the land surface parallel to the Palmdale Freeway would cost $13.5 billion, or $337.5 million per mile, according to a June 30 report in the Los Angeles Times. Now, let’s compare the two routes. The estimated $18.3 billion cost for the tunnel would be $4.8 billion, or 36 percent, more than the estimated cost of $13.5 billion for the land surface route. That $4.8 billion extra cost also would increase the $68 billion cost of the entire system to $72.8 billion, a 7 percent increase. Again, these are just rule-of-thumb estimates. We’ll have to wait until the CHSRA comes through with its won estimates of the cost of the potential tunnel to examine them more closely. According to the San Gabriel Valley Tribune, the following public meetings will allow citizens to ask about and discuss the proposed tunnel and other aspects of the project. Aug. 5, William S. Hart Regional Park, 24151 Newhall Ave., Newhall. Aug. 6, Buena Vista Branch Library, 300 N. Buena Vista St., Burbank. Aug. 7, Chimbole Cultural Center, 38350 Sierra Highway, Palmdale. Aug. 11, Acton-Agua Dulce Library, 33792 Crown Valley Road, Acton. Aug. 12, Sylmar Public Library, 14561 Polk St., Sylmar. Aug. 14, Lake View Terrace Recreation Center, 11075 Foothill Blvd., Lake View Terrace. Aug. 19, Los Angeles Union Station, Fred Harvey Room, 800 N. Alameda St. Los Angeles. The surface route also includes substantial tunnel parts. You haven’t included that in your calculation. The tunnel technique is available, there are train tunnels through the alps and there is an over 30 miles tunnel beneath the English channel between France and England. I don’t believe that more tunnels are the problem of the High Speed Train project and I mean that in terms of costs. The surface route claims to be parallel to the Freeway 14, but it is not. It cuts through unspoiled wilderness and would destroy whole towns. The way it is planned, a town like Acton would be sliced in several parts, including schools. I think the tunnel option is the better option. When did these idiots lose theur mind? High-speed rail push leading to Nov slaughter?